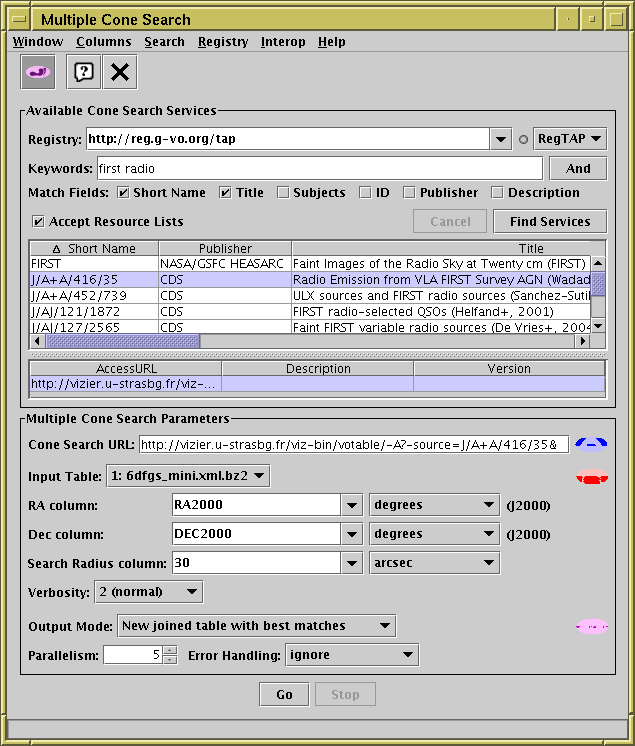 The multiple cone search window can be opened using the Multicone button ( ) in the Control Window's toolbar, or its VO or Joins menus. It allows you to select one of a number of external web services which provide remote catalogue queries, and execute a query for each row of an input table. This effectively allows you to perform a positional crossmatch between a local table and a remote one. The window consists of a Registry Query Panel at the top, and a Multiple Positional Search Panel below. If this option is selected, then the search attempts to query the service for the sky coverage it represents, if that information is available. Then it only dispatches queries for positions in the input table which fall within that coverage region, since any queries outside that region are bound to return an empty result. Depending on the coverage, this can substantially reduce the number of queries made, and hence the time taken. If there is no overlap between the input table and service coverage, the query is bound to return no results at all, and the time will be reduced effectively to zero. When in operation (i.e. when this option is selected and the service provides coverage information) the coverage of the service, input table and their overlap is summarised with small (Mollweide equatorial) all-sky icons in blue, red and magenta respectively, as in the screenshot above. This makes it easy to see the sky regions in which results may be obtained, and also the amount by which this option reduces useless queries. Currently, this option effectively works only for cone searches provided by CDS's VizieR service (publisher "CDS") which provide coverage information using Multi-Order Coverage maps (MOCs). For non-VizieR services this option has no effect.